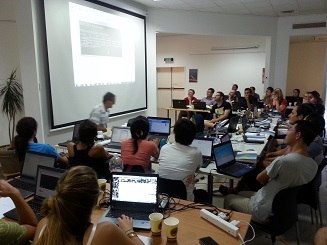 July 13-17, 2015 Hydrus and STANMOD training will be a part of the Utrecht Summer School. The course is sold out. The fee for the short course is $1195 by 4PM Mountain Daylight Time, February 23, 2015 ($1395 after February 23). You will be invoiced for the tuition balance. The fee covers instruction, course notes, refreshments, and continuing education units. Lodging and meals are not covered. Payment in full must be received prior to the beginning of the course. The registration fee may be paid by check, VISA, MasterCard, AMEX, Discover or purchase order (US Only). A maximum of 20 applicants will be able to attend the course due to space limitations. If cancellation is made before February 23, 2015 , tuition will be refunded except for the $100 deposit. Cancellations made after that date will forfeit a $150 processing fee in addition to the $100 deposit. In case of cancellation, the right to course material is forfeited. Substitutions are permitted at any time prior to the start of the course. Please be advised that if the program is cancelled due to insufficient enrollment, Colorado School of Mines will return all course fees, but will not be liable for any other expenses incurred by the prospective attendees. 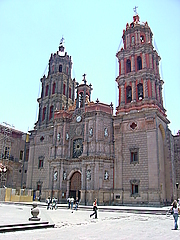 Location: San Luis Potosí, S.L.P. México. The exact location of the course venue will be announced. This course is intended for risk assessors, hydrogeologists and soil scientists who would benefit from learning more about the unsaturated zone and the flow and transport processes that occur within it. The course is intended only for participants from Mexico and Central/South America, it is not intended for participants from US and/or Canada. Basic knowledge in biology, chemistry, physics and mathematics. Basic knowledge of environmental systems, in particular soil and water systems. Basic knowledge of soil physical and geophysical processes. Mastering basic computer modeling techniques in MS-Windows based modeling environments. Iturbide 73, Salinas de Hgo., S.L.P. Numerical models for constructed wetlands (CWs) have been gaining more and more interest over the last decade. 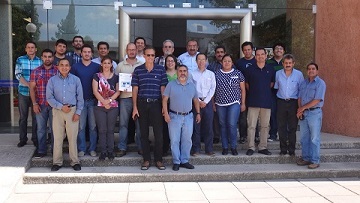 The workshop is conceived to train participants on principles and mathematical analysis of water flow and pollutant transport processes in subsurface flow CWs. BIO-PORE and the HYDRUS Wetland Module, the state-of-the-art software packages for CW modelling will be used in the workshop. "Hands-on" computer sessions will provide participants an opportunity to become familiar with the software packages. During the hands-on sessions, delegates will work on models for different types of CWs, including vertical and horizontal flow systems. Basic requirements for and common pitfalls during modelling CWs will be discussed. Practical application of models will be the final main target of the workshop. 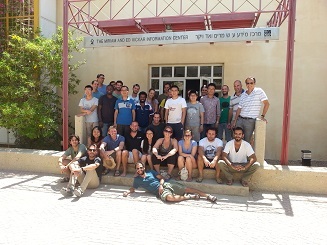 During the first day, the focus will be on general aspects of CW modelling and on modelling water flow. 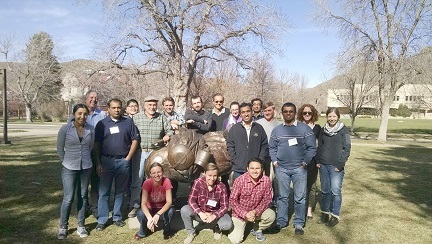 The second day is devoted to biokinetic models, i.e. models that are used to describe the biochemical transformation and degradation processes occurring in CWs. During the last day specific topics such as modelling the influence of wetland plants as well as modelling clogging processes will be discussed and simulated. Participants of any background are welcomed. No previous experience in modelling is required. Handouts, lunches and tea breaks are included in the registration fee. Attendees are expected to bring their own laptop. 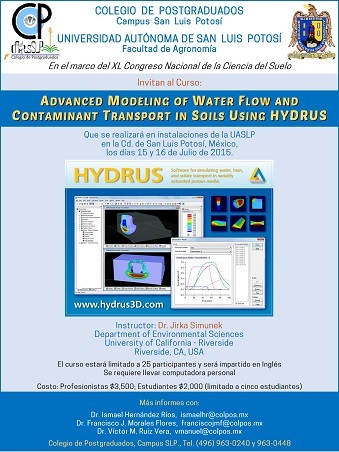 Licenses for 15 days use of COMSOL MultiphysicsTM and HYDRUS will be provided. Günter Langergraber is a senior scientist at the Institute for Sanitary Engineering and Water Pollution Control at the University of Natural Resources and Life Sciences, Vienna, Austria (BOKU University). He is the main developer of the WETLAND module of the HYDRUS (2D/3D) software. Roger Samsó is a postdoctoral researcher at Irstea-Lyon. He did his PhD on modeling of CWs at UPC and is the main developer of the BIO_PORE model. He also dealt with porous media clogging models and he currently combines that with the overall modelling of conventional wastewater treatment technologies. Nicolas Forquet is a research engineer at Irstea-Lyon. In 2009, he got his PhD in Fluid Mechanics at the University of Strasbourg. He has been using HYDRUS for the last 6 years and has been working on COMSOL for 2 years.